SNCF operates France’s national rail service and is a global leader in passenger and freight transport services. With 270,000 employees spread across 120 countries, it aims to become the benchmark for mobility and logistics solutions in France and worldwide. SNCF is a great partner for Microsoft and a good example of how a large company is transforming itself by fostering an inclusive culture. In this context, SNCF is betting on the Microsoft Power Platform as the technology of choice to accelerate their digital transformation. 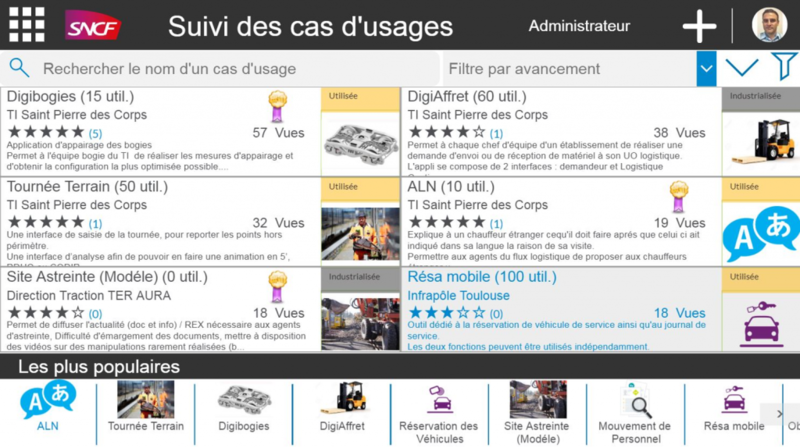 We previously wrote about the 15+ PowerApps solutions deployed at SNCF – the grassroots innovation that started the viral adoption of the Power Platform at SNCF, with the “DigiBogie” train repair app, an incident reporting app and more. In this post we look at the top-down principles and organizational structures put in place to scale up adoption to thousands of app makers across hundreds of business units creating high quality Power Platform solutions, with centralized IT putting in place robust governance and monitoring systems. It all started a few years ago when SNCF took the initiative to make tablets and phones available to their employees. The “Digital pour tous” initiative was born. An initiative that has as its ultimate goal the inclusion of everyone in the digital transformation process. As Henri Pidault, Chief Performance & Digital Transformation Officer, explains: “3 years ago, SNCF started working on this notion of collective intelligence and social networks for enterprise. We deployed Yammer and became the largest Yammer community in France”. According to Henri Pidault, this was a real access as it aligned closely with the “DNA” of SNCF which is grounded in cross team collaboration and knowledge sharing. SNCF realized early on that what matters most is the human and cultural aspects of transformation – fostering a culture both top down and bottom up that encourages everyone to be part of the transformation journey. Henri Pidault talks about 3 specific human-focused elements that are foundational to this transformation. 1) Managerial posturing & coaching: To ensure buy-in from middle management, managers and teams across the company are educated on the importance of new digital tools and are coached to embrace new emerging platforms (such as PowerApps) that allow individuals and teams to digitize their processes and remove daily irritants (challenges). 2) Operational Effectiveness: An approach to improving productivity by addressing problems at their root through individuals that are experiencing them, as they’re experiencing them. A key goal is to encourage managers to trust solutions proposed by their team – the people that are often closest to the problem. As Gabriel Chenevoy, Chief Performance Officer adjoint, explains, “When teams resolve the problems they encounter when executing their work, they in effect define efficient operational models”. These models are then easily digitized thanks to the Power Platform and can be updated in an agile way. 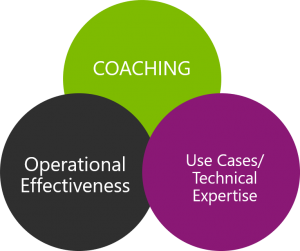 3) Identifying use cases and building technical expertise: The third element is centered around building technical expertise by focusing on real use cases. The approach is to identify use cases through the organization that need digitalization, then train and equip the relevant staff on the available tools such as PowerApps, Microsoft Flow and Power BI, and support them in solving their problem efficiently. To fuel its digital transformation, SNCF created an internal school dedicated to Office365 and the Power Platform. The digital school offers online and onsite classes from beginner to expert level. In 2018, more than 738 individuals were trained on SharePoint, Power BI, PowerApps, and Microsoft Flow. The idea is to identify expert app makers via the Yammer community and centralized administration dashboards. These experts become the trainers and content creators for the digital school. 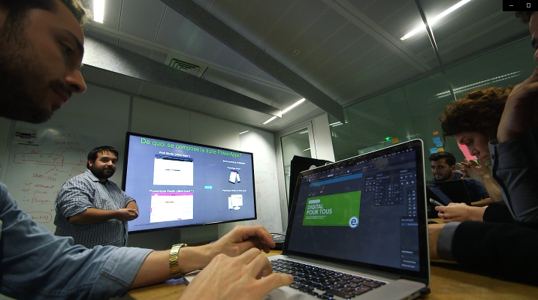 SNCF is working on an e-learning platform which will offer a guided learning path. Experts will be able to upload video tutorials on different topics that are then made available to all employees within a PowerApp. The growth of the Power Platform at SNCF has been remarkable. Over 150 apps are already in production and many more in the works. With this explosion of apps, SNCF needed a robust mechanism to monitor apps built across the organization. 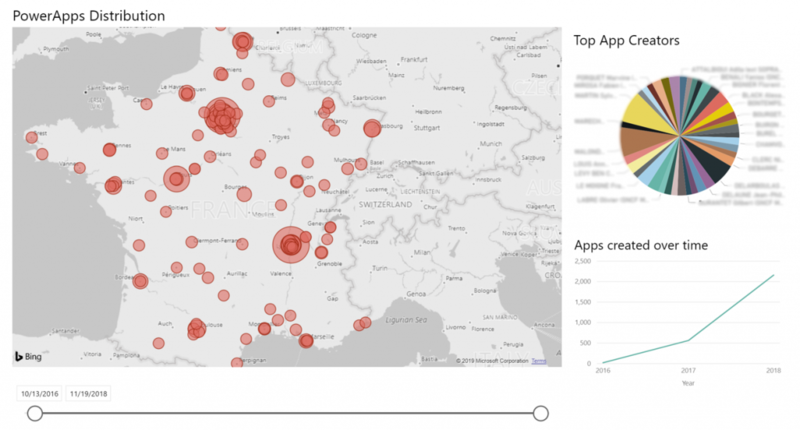 They used the administration capabilities in the platform to create a set of Power BI dashboards that monitor in real time the creation and distribution of app across France. Thanks to these analyses, they can identify business units creating apps, reach out and include them in the community, provide training on best practices, and more. For anyone in the organization to propose and vote on new use cases that need digitalization. Virtual teams are then formed to collaborate on solutions for the top voted items. The idea is for business units to consume such references and APIs. In effect, IT becomes a facilitator, an enabler for the business units eager to solve their daily problems by themselves. By defining such a strategy, a key goal is for IT to embrace the idea of business units building their own solutions, with IT playing a strategic role through infrastructure, governance and support. In addition, they’ve found that pairing app makers with firstline workers in the app creation process leads to a high level of ownership and positive acceptance of digitalization efforts at all levels of the organization. In summary, SNCF is a great example of a customer that has gone “all in” with the Power Platform. As with many customers, initial adoption was grassroots in nature – starting in some places with Power BI and others with PowerApps. They quickly realized the potential the platform represented for their business and built a company-wide center of excellence to educate, train and support the thousands of employees now using the platform to help shape the future of SNCF. The Microsoft Power Platform team is delighted to have SNCF as a close partner and look forward to continued success in their “digital for all” transformation journey.